A friend served us some lovely tomato soup last week, and told us he’d made it with a soup maker. He bought it from Lakeland, so I went and had a look there and it was £50. So then I went to eBay and found one at £40, with free postage. And I looked at it again on Friday, and it was down to £36, so that made it a no brainer. The seller was AO, and they were an absolute pleasure to deal with. 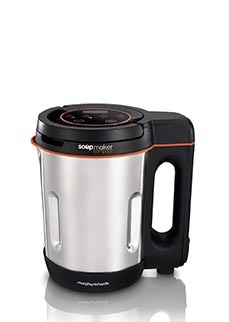 It’s a Morphy Richards 501021, and Amazon also sell it at £40. It arrived this morning, delivered by two cheery chaps – It’s quite sleek, and takes up very little room on our crowded worktop, and to honour it, we are having soup for supper, with home made rolls from this everyday bread recipe. I bake these in silicone mini loaf tins, and they’re always nice. 125g per roll, should you care – best to weigh the dough, as otherwise the rolls are all different sizes (trust me on this). In the soup maker in readiness are two leek tops, one cabbage core, a broccoli stalk, a teaspoon of Marigold bouillon, and some seasoning. We eat a lot of soup at lunchtime in the colder weather – we either have a big pot on the go, or we (sorry) have cup soups. If this machine will make us nice fresh soup from scrag ends of veg in half an hour, it’s a win in my book. I’ll let you know! Many thanks. Off to investigate.